The roof contributes significantly to the finished appearance of a home as it accounts for 30 per cent of the surface. First impressions do impact the value of the home, which is why it’s important to get the roof right. 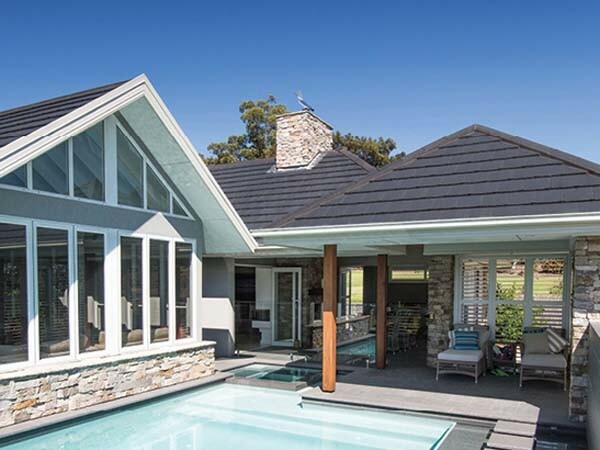 A tiled roof will protect the home in the tough Australian climate. Combining a range of functional benefits including long-lasting durability and strength, with amazing visual appeal, Monier roof tiles provide the protection you need for your most important asset – your family. Available in a wide range of colours and profiles, Monier roof tiles allow you to create a custom look for your home. Regardless of the style you choose, from the classic Hamptons to a more modern streamlined or Mediterranean look, tiles can blend in seamlessly with the exterior design. Monier roof tiles come in a choice of materials too ranging from the classic good looks of terracotta to the contemporary vibe of the composite Elemental, helping enhance your home’s aesthetic to your creative satisfaction. Australia’s harsh weather and extreme climate changes can be tough on roofing materials. Unlike metal, tiles don’t rust or corrode and terracotta tiles won’t fade over time. Please note that your standard COLORBOND steel or ZINCALUME roof warranty is limited if you live within 5km of salt water. Therefore, Monier roof tiles are the best solution to Australia’s coastline environment. Terracotta colour is forever, thanks to its manufacturing process where the colour is baked in at extremely high temperatures. Metal roofs, on the other hand, won’t retain their colour coats for a long time. Even Monier’s concrete roof tiles deliver better colour performance than regular concrete tiles, which will fade gradually over time. Monier’s concrete tiles have been tested in lab conditions simulating natural weather exposure and show better colour performance than standard COLORBOND Steel. CAT Colour is Monier’s standard colour technology that will outperform metal by four times and retain its colour for longer. C-LOC or Colour Lock Technology retains its colour for even longer, is less resistant to gloss fade, and will outperform metal by eight times. Colour Through Technology is a unique process that bakes the colour through the tile instead of a mere coating on top. Combine Colour Through with C-LOC to create a more durable tile. Contrary to popular belief, tiles will not crack if you walk on them in the correct place. Concrete tiles actually get stronger with age. In the unlikely event of cracked tiles, you only need to replace individual tiles, but a damaged metal roof would require the entire sheet to be replaced. Tiles perform better than sheet metal in extreme wind conditions as wind uplift forces are significantly lower in tiled roofs. Monier terracotta roof tiles come with a 50-year performance and colour guarantee, while concrete roof tiles come with a 50-year performance guarantee. COLORBOND Steel offers up to 36 years’ warranty on standard steel, which may be affected if your roof rusts where sheets overlap, or corrodes due to contact with the sunscreen or soil. Monier offers a number of roofing products to suit lower-pitched roofs. Concrete tiles can reach a pitch of just 15 degrees with sarking, as can the Terracotta Nullarbor and Marseille profile tiles. Terracotta Nouveau can reach 12 degrees with sarking. Additionally, the new Elemental Lightweight Composite roof tile can handle even pitches up to 10 degrees.